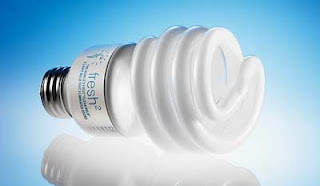 Taken from "Your Weekly Savings Tip"
Switching at least one incandescent light bulb to a compact fluorescent can cut around $30 off of your annual electricity bill. Think about how many light bulbs you use in your household and see those savings multiply if you switch over all of your bulbs. Fluorescent bulbs may cost slightly more, but they provide the same amount of light as their incandescent counterparts, use two-thirds less energy and can last up to 10 times longer. To get more ideas and money-saving tips, visit www.FeedthePig.org and subscribe to "Your Weekly Savings Tip".